The Amish Contempo Modern Bed will bring a beautiful contemporary look into your bedroom. 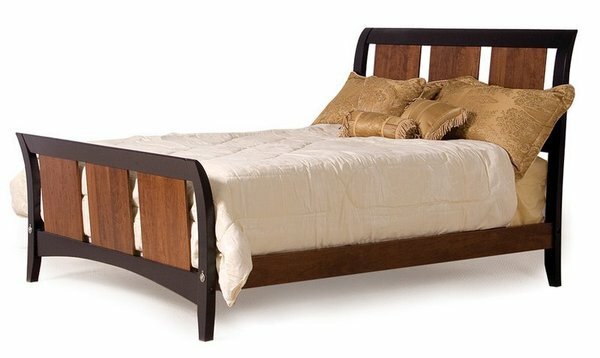 This bed is Amish handcrafted from your choice of oak, cherry or maple wood. Say goodbye to restless nights on an uncomfortable bed and hello to your new sturdy modern bed. Amish crafted bedroom furniture is made to last for a lifetime and withstand years of use. Please call one of our Amish furniture specialists with questions on the bed, finishing or ordering assistance. This bed is custom made for you at the time of order so please allow 6 to 12 weeks for it be built. Call one of our Amish furniture specialists with questions on the bed, finishing or ordering assistance at our toll free number - 1-866-272-6773. Thank you for shopping with DutchCrafters. Note on Distressing: Light Distressing will have small worm holes and minor wear marks. Heavy Distressing will have worm holes, dings, dents, rasp marks and possibly a few simulated cracks.